Did you watch a lot of the Olympics? Honestly, they don’t interest me very much anymore. Growing up, I’d watch them from start to finish. In those days, Dorothy Hamill and Scott Hamilton ruled the ice. Women even got a “Dorothy-Do” which is what Dorothy Hamill’s hairstyle was called. She was such a huge celebrity and every girl looked up to her! What did interest me this time was that they were in Korea because I’m a huge fan of Korean food. I can eat a jar of kimchi in one sitting! Actually, I think Korean food is still catching on in this country and I predict will continue to grow in popularity. If you’re new to Korean food, a main characteristic of a classic Korean meal is the abundance of side dishes and condiments that are served (such as kimchi). 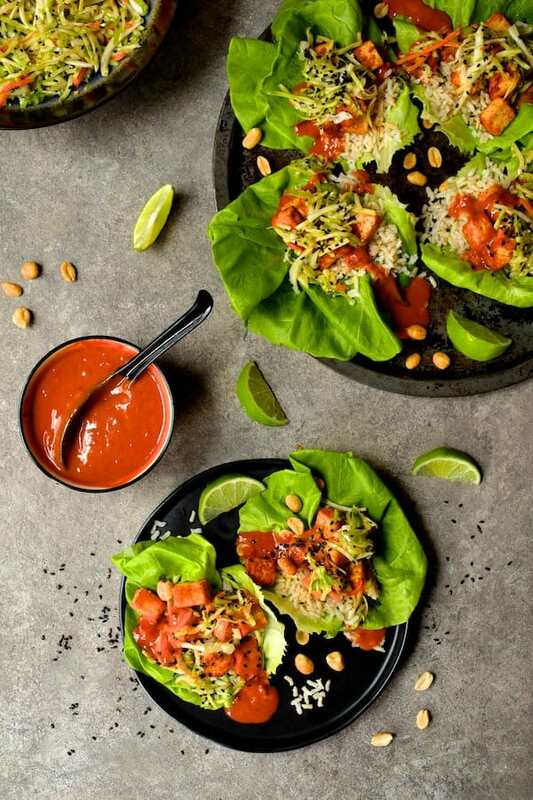 This recipe, Vegan Korean Tofu Lettuce Wraps with Tahini Gochujang Sauce and Spicy Slaw, has all those wonderful characteristics in a lettuce wrap. In my not-so-humble opinion, tofu gets a bad rap. First of all, it’s an inexpensive source of protein. Second, tofu is a culinary blank canvas because it takes on the flavor of whatever it’s cooked with. To me it’s not any different than a plain piece of chicken or a plain piece of fish–it’s all in how you season and flavor it. Because tofu is packed in water, it’s important to drain it well first. To do that, blot it dry, then cut it into thick “slabs.” Place it on several layers of paper towels, then place another layer of paper towels over it. Set a baking sheet on it then place a heavy object such as a thick cookbook or pan on the baking sheet. Let the tofu sit for an hour or so. Be careful not to place too much weight on the tofu because you can crush it. After an hour or so, simply cut into cubes for this recipe or any shape that works for what you’re making. 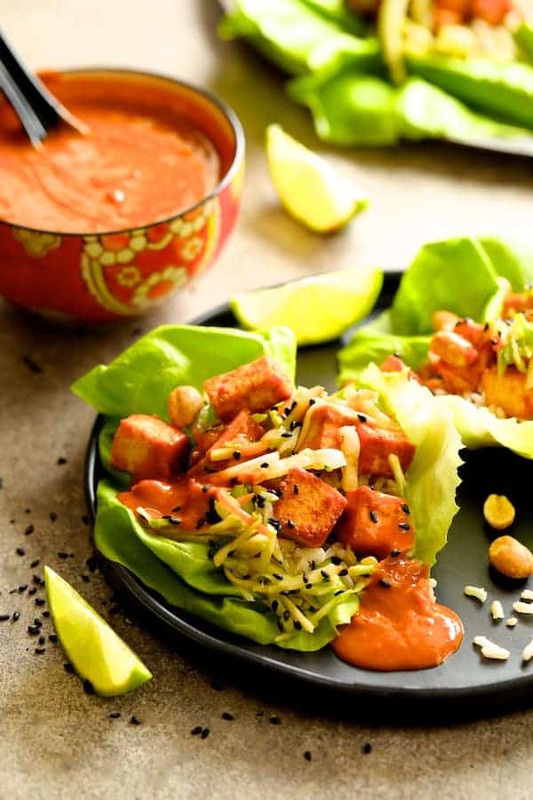 While the tofu is draining, mix up the Spicy Slaw and the Tahini Gochujang Sauce. For the slaw, I used a purchased “broccoli slaw” combination and added a little shredded cabbage to it. 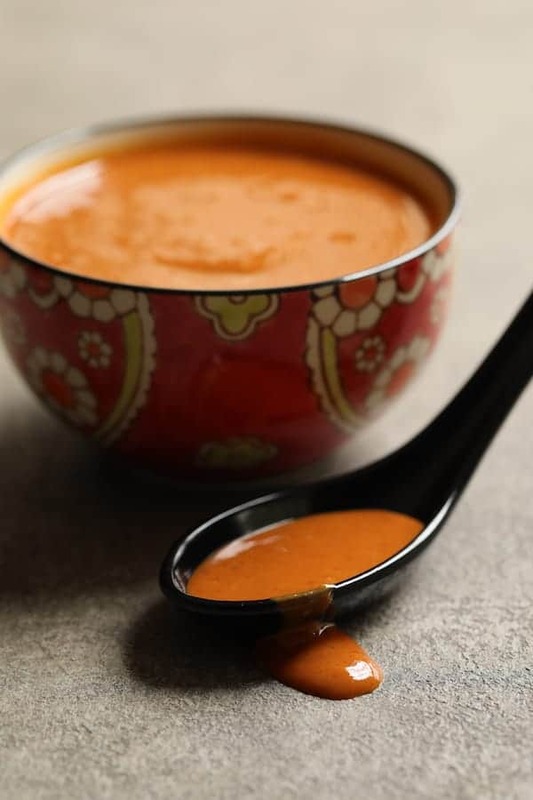 I hope you fall in love with the Tahini Gochujang Sauce as much as I have! Gochujang is a sweet, spicy, fermented chili paste that’s used a lot in Korean food and it’s gaining in popularity. I’ve heard it referred to as “the new Sriracha!” It pairs perfectly with tahini and you’re going to want to start using this combination on everything! When you have the slaw and the sauce made, brown the tofu with some of the sauce for flavor and color. Mwaaaahhhh! Serve with lime wedges, peanuts, brown rice and garnish with sesame seeds. Tofu made terrific! It’s so colorful and healthful! You may even turn a tofu hater into a tofu lover! If you’re really not into tofu, chicken would be a great substitute! 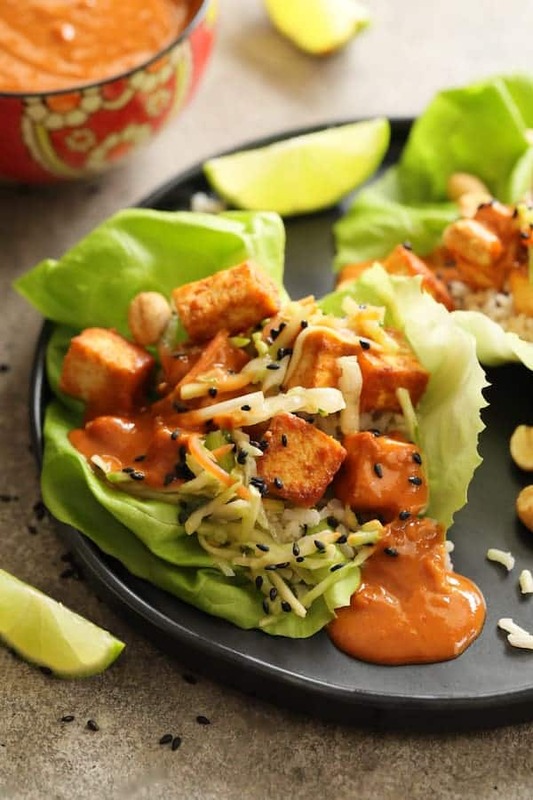 Vegan Korean Tofu Lettuce Wraps with Tahini Gochujang Sauce and Spicy Slaw! Enjoy! If you’re into meat, try my Korean Braised Beef Short Ribs! PREPARE TOFU: Drain tofu and cut into six large "planks." Place on paper towels. Top with more paper towels then place a sheet pan over the tofu. Place a heavy object such as a large cookbook or heavy bowl on the sheet pan to drain and squeeze as much water out of the tofu as possible. After 1 hour, cut tofu into cubes. 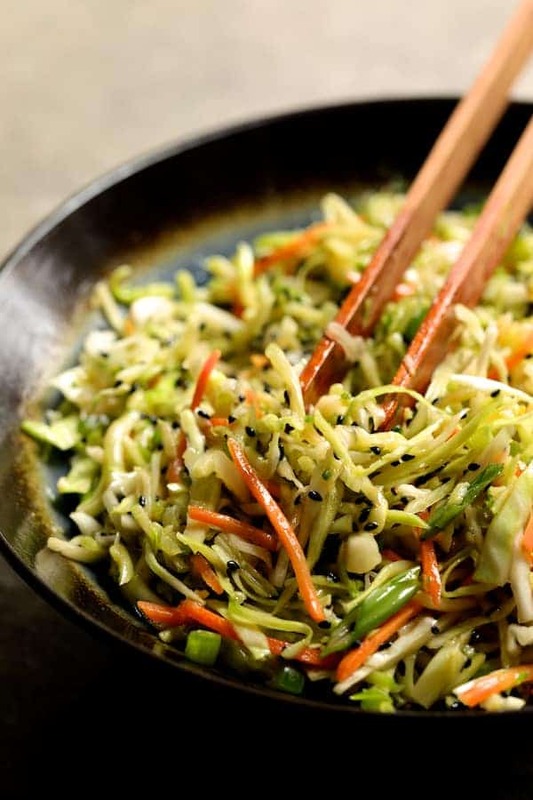 SLAW: Combine broccoli slaw, cabbage, scallions and pepper in a bowl. Whisk together lime juice, soy sauce, oils, sugar, ginger and garlic. Pour over slaw ingredients. Add sesame seeds and toss. SAUCE: Whisk sauce ingredients together in small bowl. 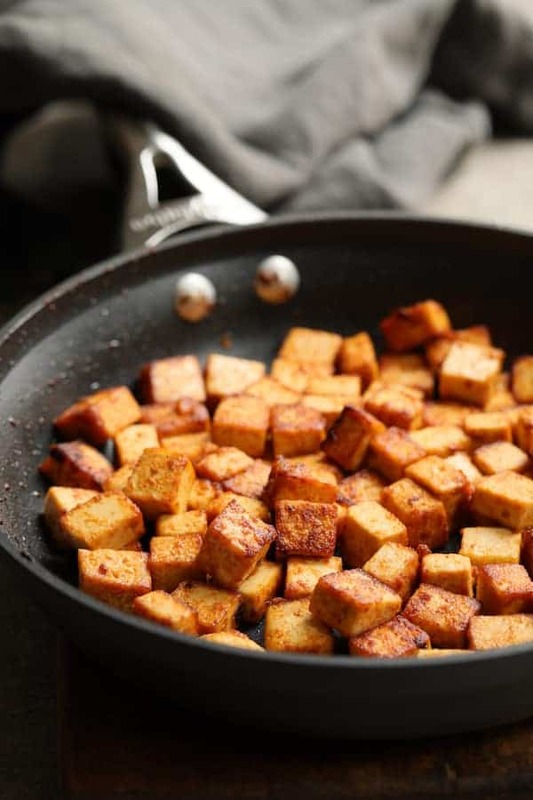 COOK TOFU: Heat oil in a nonstick skillet or saute pan over medium high heat. Add the cubed tofu and 2 tablespoons of the tahini gochujang sauce. Stir, then toss the tofu around to brown it. TO SERVE: Place lettuce leaves on a platter. Top with brown rice, the tofu, the slaw, some of the sauce and peanuts (if desired). Serve with lime wedges and garnish with sesame seeds. I had crispy tofu along time ago and just loved it. I always wanted to make it but now I have a good recipe to try it with! Hopefully I can find some Gochujang at the Asian grocery store. 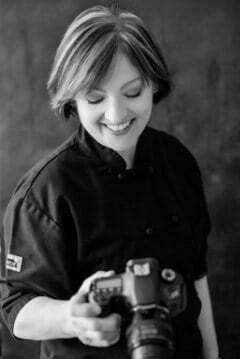 Love that you used tahini too! Thanks, Denise! Gochujang is becoming pretty mainstream. Whereas I had a tough time finding it a couple years ago, my local Kroger carries several brands now. Thanks again and hope you enjoy!